How Would You Spend Your Daily 100 watts? Could the Stock Market Crash in 2010? Scrape Away the Noise and Hype, and What Remains? Learning about past and present wars is one way of honoring those who sacrificed so much in those conflicts. Today we honor those citizens who made sacrifices that are incomprehensible to those of us who have not experienced combat or the horrors of being prisoners of war. Despite the senselessness and waste of war, it seems that the capacity to wage war is innate in humanity; even usually peaceful chimpanzees will eradicate a weaker nearby troop which is competing for limited resources. Within any society there is always a latent class of warriors--sometimes reluctant, sometimes not. When there is no war, these citizens must divert their talents into other pursuits; in peace their warrior natures are often under-appreciated or even scorned. And then when war comes, we turn to these citizens. As incomprehensible as it may be to others, the warrior is not just drawn to war; it is not in his/her nature to miss it for anything in the world. Even if we hate war with every fiber of our beings, the history of our nation (and most other nations) pivots on wars and even specific battles. Over the years, knowledgeable readers have recommended a variety of books on war, and those who have fought them. Learning their stories is one way of honoring our warriors, eager and reluctant alike. To know nothing of them and their sacrifices is not just ignorance, it is an insult. With that solemn thought, I offer this list of recommended books. Like most people, my own interests and family have guided my reading. I read Prisoners of the Japanese: Pows of World War II in the Pacific because it was written by my friend (and eminent historian) Gavan Daws. My father served in the Pacific Theater in World War Two, my uncle served in the European Theater (8th Air Force, B-17s) and my grandfather had served in a "4-stack" destroyer just after World War One, so these eras are naturally engaging. I know so many combat veterans of the Vietnam War that my interest in their stories is also natural. My wife's uncle Jackson Tsue served in the storied amd much decorated 442nd Combat Regiment Team--his name is on the monument to the 442nd in downtown Los Angeles, at the "Go For Broke" National Education Center which we visited in 2007. As for the Iraq and Afghanistan wars, a number of readers of this blog, as well as our friends and family members in the Marine Corps and U.S. Army, have served active duty in those conflicts, and it is our obligation as citizens to try to understand what they have experienced and sacrificed, and what memories will remain with them for the rest of their days. Here are the lists. There are thousands of books on these topics and this is but a tiny selection, but it is a start. Thank you, Raymond W. ($20), for your exceptionally generous donation to the site-- I am greatly honored by your support and readership. Thank you, Russ J. ($50), for your second staggeringly generous donation to the site-- I am greatly honored by your encouragement and readership. We tend to forget that "wealthy" "advanced" cities as recently as the 1950s featured nattily attired workers moving goods by their own muscle power. Correspondent John R. C. submitted a fascinating set of photos from 1950s London (U.K.) and an incisive commentary on the "politics of experience" revealed by the photos. A key part of the integrated understanding I tried to lay out in Survival+ is the politics of experience, but which I mean the hidden assumptions and structures which we take for granted in everyday experience which reflect core political and financial beliefs and the complex systems which support those beliefs. One way to understand what I mean by the politics of experience is to explore how the past is a lost land to the present. Studying photos, advertisements, magazines and private correspondence offers windows into the past, but it is no easy thing to reconstruct the entire worldview of those who lived "in the present" at that time. Thus people who were born after 1970 cannot grasp the "lived" worldview of politics, energy, media, etc. which made up "the 1960s" and the counterculture. This is why so many people have violently negative responses to my work when I present a future with positive features. Few people can imagine anything beyond what they experience now, and what they have been brainwashed into "believing" by films and visual media. Thus a "doom and gloom" future featuring roving mobs of desperate, starving, heavily armed and exceedingly ruthless urbanites who must be cut down with one's own arsenal (as per Rambo and countless other depictions of one-sided horrifically violent combat) is easily imagined by "doom and gloomers" because they have watched such scenarios so many times that this "future history" seems not just plausible but inevitable. The idea that there might be alternative, slightly more positive and considerably less bloody futures strikes them as "dangerous" lunacy. Meanwhile, to those who have read deeply of urban history, and of great cities with populations numbering in the hundreds of thousands which thrived without any fossil fuels at all--cities such as the capital of Tang China in the 800s, Ayuttaya in central Thailand in the 1500s and Paris in the early 1600s, to name but a few--the notion that huge populations must turn to machine-gunning each other down for the last few cans of green beans reflect a dangerously limited politics of experience. Turning now to 1950s London: what John R. C. discusses is a wide spectrum of transport similar to 1905 San Francisco which I highlighted in 1905 San Francisco: Great City, Low Energy Consumption (April 24, 2010). We have replaced that spectrum with an auto-centric monoculture, and in doing so we have greatly increased our vulnerability, just as planting one variety of grain has increased the probabilities of widespread blight and crop failure. The present-day politics of experience is impoverished in so many profound ways. We have collectively lost the ability to imagine a positive "present" without a vast, remorselessly profligate, wasteful and destructive system constructed of financial and physical pathologies. Lynn M’s article ( The Generation Gap and "Old" Austin, Texas) reminded me exactly of a set of photographs taken in the late 1950’s in London, a few of which are attached. The most striking thing is how much traffic there was on foot, and as Lynn M. pointed out, how men were pushing barrows and carts as a normal part of their working lives and with obvious dignity, many of whom would wear a tie every day as a matter of course. 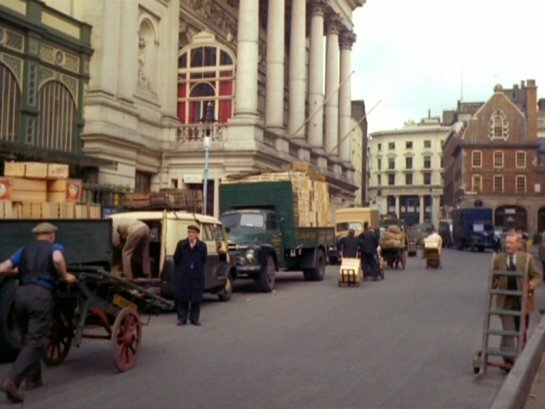 The attached picture ‘Bow Street and Covent Garden’ from the late ‘50’s epitomizes this. I can look at that picture for a minute or two and reflect on what it is saying, and seeing the way the men are working somehow brings a sense of shame to me about the undignified way we often lead our modern-day ‘convenience’ driven and automobile dependent lives. and very few passenger cars. Cars were clearly the exception rather than the norm. This change has all taken place within my lifetime (I was born in 1958), and frankly pictures like this with men at work using their own power and skills does give a sense of nostalgia and respect for people who worked like that not so very long ago. The idea that men would push carts to and fro, day in day out to make their living must appear very ‘odd’ to people in their 20’s, 30’s and even 40’s today. The idea that to get from one part of town to the other that you should need to catch a bus or get on your bicycle is probably also quite odd. Reality has become very different just in the space of a few decades. We’re living in a society now where the unsustainable is taken as the norm and with the view, by most, that this will last forever. The fact that you can get a package by UPS from Hong Kong to Buenos Aires in a day or two appears impressive in the results that it achieves, but the unsustainable means it uses with all the resultant pollution is in itself highly unimpressive and leaves a bad taste in the mouth. Processes should be inherently sustainable, not having adverse effects on others by creating greenhouse gases and so on. Engineers can develop processes which are more sustainable that others, but the modern day market forces seem to nearly always favor the unsustainable. I can respect a man who plies his trade pushing an ice-cream cart up and down the hills of Austin, TX, day in day out, or one who pushes loads to and fro at the fruit and vegetable market or one who works at a fish stall like Tubby Isaacs selling people’s daily foodstuffs. But I couldn’t give that same level of respect to a stretch limo driver of today. Deep down there seems to be something fundamentally “wrong” with the latter. It just grates me to see vehicles like this on the road or those enormous Hummers, since these clearly represent pure self-indulgence or a sense of frivolity which the working men that we see in the enclosed pictures would likely not comprehend. Now I understand that I can fall into the trap of simply wanting to admire the generation of men of which my father was one. That is natural, and why, for example ‘retro’ looking cars modeled on the late 50’s or early ‘60’s prove popular with men of my age. But somehow I don’t think that is the trap I’ve fallen into here. We are all aware of the massive amount of damage being done to the planet as a direct result of our continual striving for what is presented to us as ‘convenience’, but which may also be more rightly seen as a step-by-step development of unspoken self-indulgence and slothfulness. The ever-increasing ‘convenience’ we experience simply results in more and more people becoming so unapplied to the normal requirements of daily life that even taking the trash to the kerb becomes something to procrastinate over, to try and pass onto others, or to whine about in conversation. Is this how we would wish to view the ‘progress’ of the last 50 years – that some people have become too lazy to readily take the trash to the kerb? Perhaps I’m entirely wrong, and that those men of the late 1950’s would jump at the idea of sitting in a stretch limo all day long instead of pushing their carts and wares. Perhaps they would and I would be wrong and naïve. “Who wants to push a barrow all damn day?” -they might say to me. But deep down, I somehow feel they would regard driving that stretch limo for people to party in the back seats as not being real work and therefore unproductive and beneath them in their eyes. While I may not have clearly expressed the full extent of what I am trying to say, hopefully you will agree that there may be something worth using here in one of your blog. Wasleso’s full set of photos can be seen at: London in the 1950’s or as a slideshow. 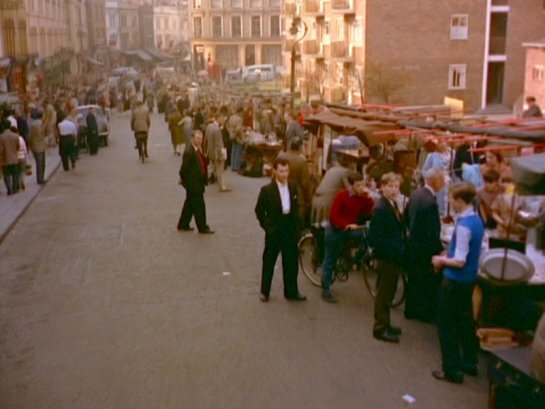 His full set of photos of London in the 1960’s can be seen at: London in the 1960s or London in the 1960s as a slideshow. He has further picture sets from the 1970’s at: the 1970s or as a slideshow. It’s a very impressive collection. You can see how the traffic increases with each year, especially after about 50% of Britain’s railroad system got axed in the 1963-65 timeframe – probably another devious ploy by the car and oil companies to put more people on the road. Thank you, John R. C. for a deeply insightful commentary and archival links. If you haven't visited the forum, here's a place to start. Click on the link below and then select "new posts." You'll get to see what other oftwominds.com readers and contributors are discussing/sharing. Thank you, Richard M. ($20), for your most generous donation to the site-- I am greatly honored by your support and readership. Thank you, Dan T. ($10), for your outrageously generous financial support of the site-- I am greatly honored by your encouragement and readership.